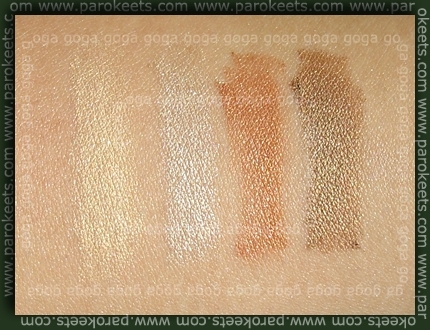 The palette contains of four warm shimmer colours, which can be nicely combined. You can use them as eye shadow or as bronzer and highlighter for your face. At the moment I’m very satisfied with this palette. I use the lightest colour as highlighter and the darkest as bronzer for my face. Where can i get this?? Its sold out!! Tole paletko sem si pa drugače predstavljala. Sedaj pa vidim, da je zelo uporabna. Verjetno jo bom več al manj uporabljala kot HL ali bronzer. Zanimiva paletka. Kako si kaj zadovoljna z obstojnostjo?